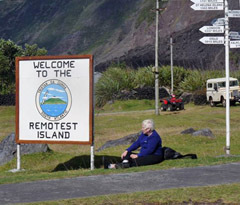 Reports of visits by cruise ships to Tristan da Cunha during the 2010/2011 season. The Adopt a Penguin Scheme was set up in response to the Oliva disaster at Nightingale and the rescue of Rockhopper Penguins. Visitors, especially those from cruise ships who saw the efforts being made to save the lives of oiled penguins paid £50 to adopt a penguin and a certificate was issued as a souvenir. On each certificate was the adopter's name and the name of the penguin which the individual chose. Lots of lovely names were chosen including Slick, Rocky, Guppie, Zuul, Calshot, Cordelia, Pinguini, Lyrian, Julie, Lurian, Mees, Noor, Lurei, and Limahl. A total of £2,500 was raised from the scheme and all funds went to the Environmental Disaster Fund. This money will assist with the local monitoring of penguins in the months and years ahead. A big thank you to everyone who donated. 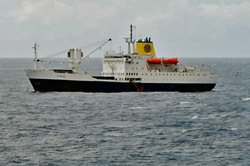 After a visit to Gough Island the Plancius arrived at Tristan on the 12th April 2011. On the trip up the ship struggled with a head swell and so instead of arriving in the morning as predicted she didn’t manage to get here until midday. After battling with weather she arrived at Tristan to a calm sea to join four other ships already anchored. Dawn can’t ever recall or has heard anyone speak about so many ships at Tristan at any one time, it was more like a bunkering station. Tours and activities that had been planned for the day had to be pushed forward to later times due to the ship’s late arrival. Finally visitors were landed and tours began. There was one lady interested in a hike to the base so two local guides set off with her with the intention that they had to be back before 5pm. Everyone enjoyed the open venues and once again the Visitors Centre was full with everyone enjoying the lobster sandwiches and buying lots of handicrafts and philatelic material. At 5pm all visitors boarded including our base hiker who I believe had accomplished the hike within 2.5 hours. With so many Islanders working to rehabilitate penguins guides were in short supply so the Visits Liaison Officer acted as guide to make landings at the outer islands. Weather was good the following day 13 th April and a landing was made at Inaccessible Island and visitors were fortunate enough to see the endemic flightless Inaccessible Rail. Afterwards the ship went over to Nightingale but unfortunately weather was not suitable at the landing area. 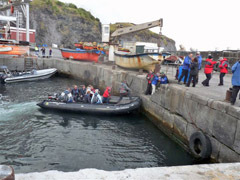 Zodiac tours were possible though and visitors had a close-up look of the island, its wildlife, and the Oliva wreck. On the return voyage to Tristan the Plancius kindly brought home several men who were on Nightingale monitoring the oil pollution situation. 14th April again brought another lovely day and saw the Plancius anchored on Tristan’s shore again. Activities began in full swing and about 30 visitors hiked to the Base. Patches, volcano and town tours were all underway again and much more leisurely this time as the schedule was not so tight and the weather sunny, calm and warm. Soon the Base hikers were back and everyone was making their way to the harbour. Another brilliant day at Tristan da Cunha and once visitors were all on board the Plancius set off for St Helena Island where it is hoped they will have another great visit. The Plancius was the last ship of the tourist season and so Dawn and her team we will now review the season to further improve the service to visitors arriving from September 2011 for another season. that have called in at Tristan that are also featured in the set. Former Chief Islander Conrad Glass attended a ceremony to commission MV Plancius held in the Netherlands in 2009 and featured in the February 2010 Newsletter. The sailing ship Barque Europa arrived at Tristan on the 8 th April. Due to arrive here on the 6 th, she battled for days to actually reach the island as wind directions were against them and so to be able to succeed they had to motor the last part of the voyage. This meant using up all their diesel fuel, and it was feared they would be unable to land and have no fuel supply to get them to Cape Town. Thankfully, although weather was not good, the intrepid passengers were able to disembark and the transfer of diesel fuel to ship began. Dawn was at the harbour to greet everyone and by this time it was pouring with rain. Everyone got a good Tristan soak coming ashore and local guides took everyone up to the Post Office & Tourism Centre for hot coffee. When all 38 passengers and some crew had disembarked Dawn made her way back to the visitors centre to welcome everyone to Tristan and get started with the tours. Despite the rain, which by now had started to ease, five visitors went on a long hike to the Hillpiece, Patches and Bluff area, twenty went off for a tour around the Settlement and all others enjoyed the sights and scenes around the island, as well as enjoying the lovely lobster sandwiches selling at the Post Office & Tourism Coffee Shop. In the afternoon four visitors went off to play golf, unfortunately when they were half way through their game the weather deteriorated and the ships horn sounded to call everyone back. There was a bustle of activity and everyone started making their way back to the harbour where two very slow zodiacs were waiting to take them back to the ship. Arriving at the pier Dawn found a jolly crew member disappointed that in all the rush he had left his postcard. Caught up in all the rush he had left it at one of the venues. Promising to post him another he quickly scribbled down his address. In case he gets to read this page, please be rest assured that Dawn did find his postcard and it has been posted and has left the island by the next ship which left on 21st April. After everyone had boarded, the ship stayed at anchor for a few more hours before leaving for Cape Town. Dawn and her team wish them good luck in their travels and hope to see the Barque Europa next year. The MV Explorer arrived at Tristan on 22nd March at 8.30am, after undertaking a quick detour to Nightingale Island to assess the situation there from the Oliva disaster. Weather was not brilliant when she first arrived at Tristan and there was some debate as to whether Explorer would land visitors or not. But the ship does not carry the name for nothing and is most certainly an explorer at heart, so the first scout boat was sent in for immigration and disembarkation of visitors was soon underway. At the harbour visitors were greeted and self-guided booklets of the Patches and Settlement area were given out to enable them to more easily navigate themselves around . 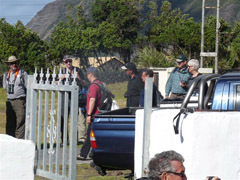 Local guides were waiting at the harbour front and groups of people were whisked away for a Walking Tour of Edinburgh, Walking Tour of the 1961 Volcano and for the very first time 3 visitors went beach fishing out in the Bluff area situated beyond the Potato Patches. Three visitors visited Jews Point by zodiac with local guide to see a Penguin Rookery. Unfortunately weather was not suitable to get close enough inshore to view this area clearly, so they were brought back to the Settlement to visit a penguin thought to be moulting in the Patches area . Dawn aims to please and on Sunday 20 th had visited the Hardy Gutter where a penguin had been spotted and sure enough there it was sitting moulting happily. Dawn was certain it would still be there for the Tuesday, but would when the penguin group arrived there, it had gone and was nowhere to be seen. Dawn was not sure who was the most disappointed, the penguin group or herself as Tristan’s Tourism Co-ordinator. After lunch those interested went on a walking Tour of the Potato Patches area and for those that weren’t up to walking, took the opportunity of a bus tour there with a local guide. This option was so popular that two bus runs were organised to accommodate everyone. By afternoon the weather had changed direction and had calmed and the sun shone and it was a lovely summer’s day. The happy fishing group arrived home and was proud to have caught a few Five Fingers. Covered in sand, salt and sun they certainly had an eventful day. Once again, the day had passed all too quickly and it was time for visitors to depart. They were all waved off from the harbour front where we hoped they would visit again one day. There were a few people on board who had visited before and if my memory serves me correctly, there was one visitor who had been here five times already. The following day weather was even better and MV Explorer left for Nightingale Island. With local guides already there assisting with the penguins from the Oliva disaster, a few were soon deployed to assist in the landing of some of the Explorer visitors. Sadly for them Nightingale was not as beautiful as normal, due to the effects the disaster had on the penguins and some bird life. Never the less, they had the opportunity to look around and see for themselves some of the devastation that was caused. After some zodiac cruising around Nightingale, the ship left for Tristan again where she needed to refuel with the MV Edinburgh. After this had been carried out she left into the setting sun for St Helena. On the 17 th March, after days of flat calm weather, it was unfortunate that the Prince Albert II arrived in Tristan waters as the weather deteriorated and was immediately involved in a dramatic rescue of crew from the stricken cargo ship MS Oliva off Nightingale Island as reported on our separate Oliva pages. 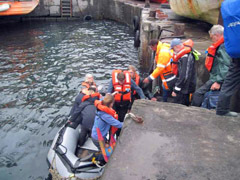 The following day weather was still not suitable for landing but a RIB was launched to bring Catholic priest Monsignor Michael ashore who had travelled from the Falklands aboard the cruise ship and was making another welcome return to the island. In the afternoon a trek to the 1961 Volcano went down a treat and at the 1961 summit everyone had a great view over the Settlement of Edinburgh. A walking tour to the Potato Patches was also in progress, with those not wanting to hike taking the opportunity of visiting th e area by taxi. It was a great day enjoyed by all and the community was thankful the Prince Albert decided to visit when she did. The ship kindly sent ashore wellingtons and jackets to assist with the Penguin operation at Nightingale. For this and their assistance with the rescue of the Oliva crew, the people of Tristan are immensely grateful. 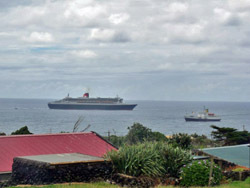 On 1st February 2011 the elegant 151,400 tonne liner QM2 made a brief call at Tristan da Cunha. Captain Paul Wright has reported that as they were on a full speed run to Cape Town they had no time to allow Tristan Islanders to come aboard to sell stamps and souvenirs or to stamp passports. Captain Wright thought it would be difficult to offer trips ashore for over 2500 guests, but hoped that Carnival UK who also operate the smaller P and O ships may choose to include Tristan as a port of call during future world cruises. He added that 'I have no doubt our guests will report very positively on your beautiful Island. I certainly have done so to Carnival UK. Many thanks for the delicious lobster tails! Robin Repetto's photo left shows the QM2 off Tristan with RMS St Helena on 1st February 2011. The crawfish tails were part of a gift from Islanders to the ship taken by the Wave Dancer which also brought ashore gifts from the QM2. RMS St Helena made a most welcome return to Tristan da Cunha on 31st January 2011, staying for three nights and enabling passengers to stay ashore. A hectic series of events centred around the first visit for Governor Andrew Gurr which are highlighted on our separate Governor's Page. The RMS left for St Helena on Wednesday 2nd February on the second leg of a triangular cruise to and from Cape Town. Photo from Sean Burns shows the RMS at anchor on 1st February 2011. It was with great excitement that the RMS St Helena arrived on Tristan’s horizon on Sunday 30 th January after a gap of five years though after a week of calm sunny weather it looked as though the conditions were deteriorating. Two RIBs Atlantic Dawn and Arctic Tern were used to ferry passengers ashore and despite choppy condition this was carried out very quickly. Passengers were greeted at the harbour and were given a warm Tristan welcome. Many of them had opted for home stays so after being introduced to their host they were then whisked away to enjoy a three-day Tristan experience. The Tourism Department planned a three-day programme for all those visiting to enable them to get the most from their Tristan experience. The first day began with a service at St Mary’s Church at 10.30am. This was then followed with Cultural Tours of the Settlement of Edinburgh, Potato Patches and 1961 Volcano. Attendance was very good and local guides were soon off with groups of visitors to show them the great attributes of Tristan. 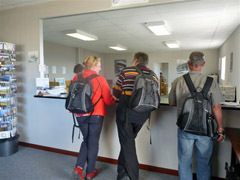 For those that wanted to hike at leisure Self Guided Tour Booklets were available for all. At 3pm a tour of the Islands Lobster Factory began. So many attended that visitors had to be split into three groups and Dawn entertained those waiting whilst others were enjoyed their factory visit. Also open were the Post Office & Tourism Centre, Albatross Bar, Supermarket, Café, William Glass and Desiree’s Souvenir outlets, and so some shopping in ‘town’ was also on the list of options. Amongst all the other activities there was great excitement when word got around that some penguins and a seal with pups were seen in the Bluff area. Throughout the three days, taxi’s were busy ferrying people to and fro to see this lovely sight. Monday morning dawned and unfortunately weather was poor. Visitors that did not choose home stays were not able to disembark and so the RMS circumnavigated the outer islands. For all others a Craft Day was organised at the Prince Philip Hall Community Centre starting at 9am. Here, they were able to see carding and spinning of local wool, model boat building, knitting of novelty penguins and a few more small outlets selling handicrafts. While this was going on, a plaque was laid by Governor Andrew Gurr to commemorate 50 years since the eruption of the 1961 Volcano. This event led to the evacuation of the entire population to the UK for two years after which they returned in 1963. At 2pm a show by St Mary’s School children was performed and this portrayed the 1961 volcanic eruption. Afterwards a tea party with the islands pensioners was organised and gave an opportunity for visitors to chat about the Volcano years. A reception for the whole community in honour of Governor Gurr was held at 7pm in the Community Centre. Well attended by all, visitors had the opportunity to meet and chat with the island community as well as eat delicious food, especially lobster, all prepared by Atlantic Fresh Catering Service. Governor Gurr and Mr Michael Swales were each presented with a longboat, Governor Gurr’s from the community and Mr Swales was from the congregation at St Mary’s Church in appreciation for the new church organ that he presented on behalf of the Tristan da Cunha Association. Tuesday, the third and final full day, was an early start with hikers trekking up Burntwood. Because a few were still on board RMS ST Helena, one trek started at 7.00am with a group of 14 and the other at 9.00 am with a group of 5. A trip was also planned to Queen Mary’s Peak and Nightingale Island but due to weather conditions this had to be cancelled. At 10am visitors had the opportunity to visit with a few of the pensioners to see work carried out on the Thatched Tristan House. They were able to see the shaping and placing of soft stone and one visitor even had the honour of laying a penny under the foundation stone of the west gable end. For lunch that day the Post Office & Tourism Coffee Shop provided some local cuisine. Apple Turnovers and Teddy Cakes (Potato Cakes) were on the menu and they were so enjoyed that we sold out. To add to this the Queen Mary 2 decided to pass close by Tristan and there was great excitement as everyone rushed out to watch this grand event. The blowing of horns from one ship to another was quite emotional and very much a sight to see. A Golf Match was planned for the afternoon and was enjoyed by three visitors. The slide show had to be cancelled as the weather deteriorated as Captain Young called those passengers staying aboard overnight back to the ship. Tristan is most certainly dictated by the weather and the forces of nature are not always the easiest to plan around. On Wednesday morning all visitors still ashore began embarking followed lastly by Governor Gurr who it was a great pleasure to meet. After everyone was safely onboard the RMS St Helena left for St Helena Island at 9.45am. As the community saw her leave our horizons many thought she would never return again. The visitors from the RMS St Helena were a great bunch and Dawn hopes they enjoyed their three-day stay. The MS Bremen called at Tristan on 19th December 2010. The ship arrived at 8am and weather was favourable. Passengers disembarked at 8.30am where they were greeted at the harbour and had the opportunity to buy brochures and guidebooks. Passengers made the most of the new Self-Guided Tour booklets and hiked at leisure around the Settlement of Edinburgh, 1961 Volcano and the Potato Patches. This was finished off with a visit to the Post Office & Tourism Centre where they enjoyed lobster sandwiches, Christmas muffins and coffee with the opportunity to pick up some handicrafts and postcards. For those who needed something cold the Albatross Bar was there to assist. Archive photo of a previous MS Bremen visit on Friday 17 March 2006 showing the ship about to depart with its 105 passengers for Nightingale Island. Also shown is the smaller cruise ship MV Alexey Maryshev, just arrived with 43 passengers for a two day visit. Passengers left the island at midday with local guides and headed for Nightingale Island where they enjoyed zodiac cruises around the island. 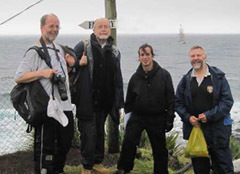 This gave them the opportunity to enjoy and see some of Tristan’s great wildlife. 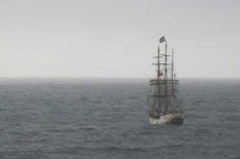 Local guides were brought back to Tristan at 7pm and the Bremen proceeded on her way to South Georgia.